In the first part of this series on UV Light, we learned that it was once thought that sunlight was a bactericide. It is now known that UV light (from the sun or from any other source) kills not only bacteria, but molds, protozoa, yeasts, and even viruses. From http://www.ultraviolet.com/microorgan.htm we found the following table. These are all the known bacteria, viruses, molds, yeasts, and protozoa that can be killed by UV Light, followed by the UV dose required to do the job. By know, we mean those known at the time this table was constructed. Scientists are still finding more with further investigation. 1. "The Use of Ultraviolet Light for Microbial Control", Ultrapure Water, April 1989. 2. William V. Collentro, "Treatment of Water with Ultraviolet Light - Part I", Ultrapure Water, July/August 1986. 3. James E. Cruver, Ph.D., "Spotlight on Ultraviolet Disinfection", Water Technology, June 1984. 4. Dr. Robert W. Legan, "Alternative Disinfection Methods-A Comparison of UV and Ozone", Industrial Water Engineering, Mar/Apr 1982. 6. Rudolph Nagy, Research Report BL-R-6-1059-3023-1, Westinghouse Electric Corporation. 7. Myron Lupal, "UV Offers Reliable Disinfection", Water Conditioning & Purification, November 1993. * Approximate - Various sources may report different inactivation dosages. When microbes are exposed to UV light, the nucleus of the cells absorbs the UV energy, which “scrambles” the DNA structure. This sterilizes the cell and it can no longer reproduce. Thus, because it cannot reproduce (which is how an infection takes off) it is considered dead and no possible threat. The thicker the organism, the more light (or time in the light) is needed to reach the organism’s DNA structures. Take giardia. 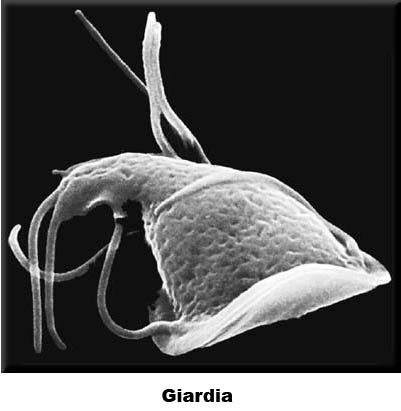 Giardia is a parasite that is much larger than any bacterium. It is a multi-cellular creature. The amount of light needed to scramble the DNA in giardia is more then ten times that is used to kill the infectious hepatitis virus and more than 20 times needed to kill the dysentery bacteria. Hospitals use UV light as an adjunct to their normal sterilization procedures. It just makes sense to do all you can to kill germs in a hospital. When it comes to water purification and water treatment, UV light kills many more microbes than chlorination. The hepatitis virus can survive swimming around in chlorinated water for a considerable time, but is quickly wiped out by UV Light. One might ask the question, why are there no UV Light water treatment sites in this county. Actually, there are, but they are very few. In Canada there is a movement to replace chlorination water treatment plants with UV light water treatment plants. In the US, our chemical companies have way too much clout, or to put it in figures we can all understand, they have more lobbyists than the UV light crowd has. Let’s take a quick look at the downside of chlorination. The production of chlorine is energy intensive and wasteful. Byproducts of chlorine production are toxic to aquatic life. Chlorine is a hazardous substance. Storage, transportation, and handling is a potential safety hazard. A chlorine tank is a perfect target for any terrorist with a gun and a single bullet. Chlorine is much less effective in killing virus than in killing bacteria, and still not as effective as UV Light in killing both. Chlorine attacks your arteries and is a powerful contributing cause to Cardiovascular Disease. Chlorine in the blood forms calcium carbonate, the main cause of strokes (prior to the chlorination of water, Transient Ischemic Attacks (TIA) and strokes were nearly unknown). No chemical consumption, no storage or transportation issues. Minimal moving parts and highly reliable. Disinfects better than chlorine, killing more waterborne microbes than chlorination. More cost effective than chlorination. There you have it. Given the above, UV light is the ultimate choice for water purification, but don't expect it soon in your neighborhood. The monied interests are just too powerful and even when our leaders continue spewing that they are protecting us they still allow dangerous dangerous chlorine to be made, stored, and transported creating a myriad of targets for any terrorist or nut with a single bullet. However, when it comes to water purification, it doesn’t end here. UV light works only on biological contaminants, not chemical contaminants. Further filtering is required. There are many companies that make home water filtering systems, and if you live in a rural area, you might want to consider one with UV light. As we mentioned above, new microorganisms that can be eliminated by UV Light are being discovered all the time with further investigation. This might cause you to wonder if some of these new antibiotic resistant bacterial infections can be treated with UV Light, or if HIV/AIDS can be treated with UV Light. The answer is an overwhelming Yes. However, again, as simple as incorporating this wonderful medicine into our health care practices, it seems that medicine, the largest monopoly in America, is the only obstacle. And don't expect that to end soon either. Don't forget to read Part III of this series. © Copyright 2006 Minnesota Wellness Publications, Inc.